Optio Solutions is proud to be one of only 60 ACA (Association of Credit and Collection Professionals) members to have attained this highly respected certification. The PPMS (Professional Practices Management System) program is based on adhering to 18 industry-specific practice and policy categories. PPMS processes improve data security, create increased awareness of compliance requirements, incorporate better staff training and provide the basis for professional and efficient handling of issues. 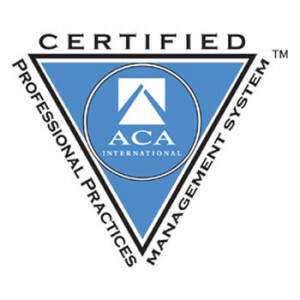 To become certified through ACA’s PPMS program, a collection agency must complete extensive documentation, internal audits, third party audits and various training programs, followed by a detailed application process. Annual ongoing auditing, evaluation and compliance are also required to maintain certification. This certification demonstrates Optio Solutions’ commitment to providing the absolute best in professional business practices and quality assurance to our clients.